BOCA RATON, Fla. – August 28, 2018 – MobileHelp®, a leader in mobile Personal Emergency Response Systems (mPERS) and healthcare technology, announced today an exclusive partnership with LifePod Solutions, pioneer of a natural, proactive voice service for older adults aging at home as well as patients and their caregivers. The partnership will provide customers with access to the MobileHelp emergency response system and LifePod’s proactive voice dialog management platform through popular smart home speakers such as the Alexa-enabled Echo from Amazon. With the addition of MobileHelp emergency response, LifePod will be able to provide a voice-enhanced caregiving experience for consumers and their loved ones: without any additional hardware, people will be able to summon the help they need – be it a family member or an emergency response service – to their location by simply using their voice. The first version of the MobileHelp emergency response-enabled LifePod service will be available in Q1 of 2019. LifePod Solutions is improving the quality of life for caregivers and their loved ones and clients by providing proactive-voice, intelligent and connected services to support aging adults as they age-in-place. 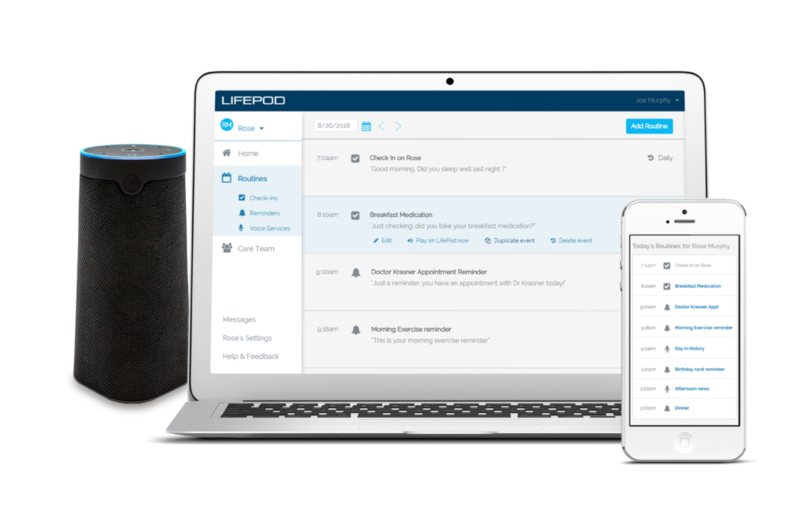 LifePod’s easy-to-use voice service expands the capabilities of popular smart speakers with patent-pending innovative technology and service that provides natural voice dialogs, configured and controlled by remote caregivers using an online portal. The LifePod Family Caregiver service offers proactive, voice-based check-ins and reminders, and encourages users to access other online services (e.g., music, weather, therapy, etc.) to enhance their day and help them feel more connected. The LifePod team, led by veterans in virtual assistant technology, speech recognition, IoT sensors and online services for aging adults, works closely with families, professional caregivers, and senior living facilities to improve health outcomes and reduce the costs of long-term care. To learn more or sign up for the LifePod Beta Program, visit http:https://lifepod.com.